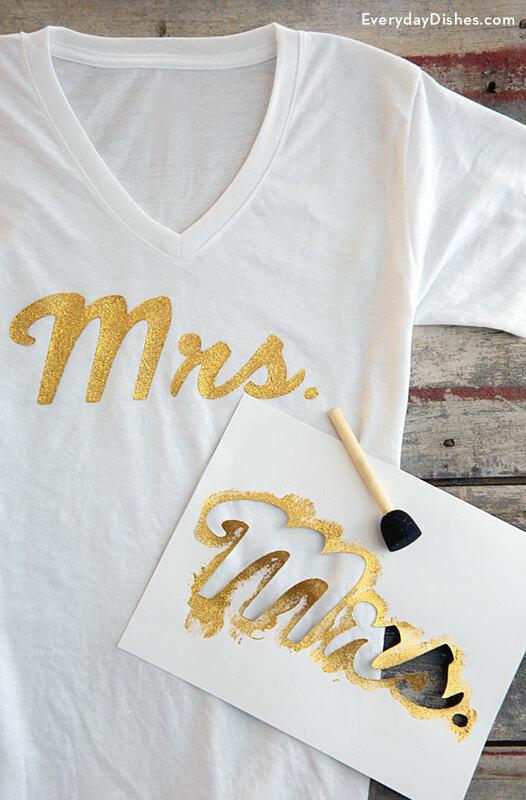 You’ll spot the guest of honor a mile away when she wears this sparkly DIY Mrs T-shirt. Our template and glitter paint make it a fun craft that’s super inexpensive. Not only is this a fun shower gift, it’s also the perfect alternative to the usual bridal veil worn at bachelorette parties. She can even take it on the honeymoon! Stenciling isn’t difficult but you don’t want to rush it. Resist the temptation to wipe excess paint off the stencil as you work—paint could seep underneath and the lines will not be as clean as you would like them to be. Fabric glitter paint adds the necessary sparkle the occasion demands. To keep the color vibrant, remember to turn the shirt inside out before washing. Download the DIY Mrs t-shirt stencil template and open in Adobe Reader. Spread your T-shirt out on a flat, protected work surface. Insert a piece of cardboard between the front and the back. Spray the back of the stencil with adhesive. Center it towards the top of the shirt and adhere. Using a brush, dab glitter fabric paint evenly onto the stencil cutout and the shirt. Once coated, carefully lift off the stencil and allow paint to dry completely before wearing. Insert cardboard between the front and back of the shirt to prevent paint from bleeding through.